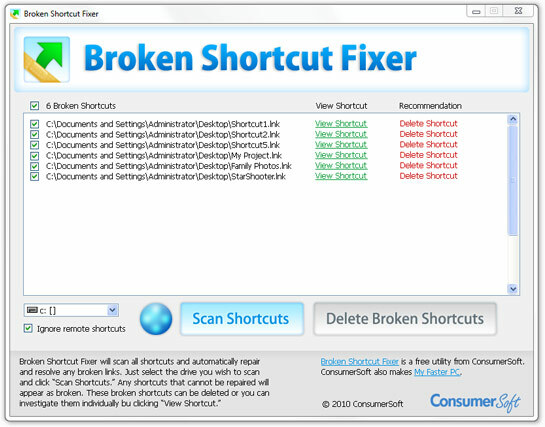 ConsumerSoft is proud to offer Broken Shortcut Fixer, our freeware title offer you an easy tool to scan your computer from broken shortcuts. Broken Shortcut Fixer will also automatically repair any shortcuts that it can find using the Windows link resolve method. Get in control of your shortcuts today with Broken Shortcut Fixer. New in Version 1.2: Now includes an installer and several bug fixes..
How does Broken Shortcut Fixer work? Broken Shortcut Fixer will scan all shortcuts and automatically repair and resolve any broken links. Just select the drive you wish to scan and click "Scan Shortcuts." Any shortcuts that cannot be repaired will appear as broken. These broken shortcuts can be deleted or you can investigate them individually by clicking "View Shortcut." • Click "Scan Shortcuts" to repair and find broken shortcuts. • Double-click broken shortcuts to view them in Windows. • Hover over a broken shortcut to see the broken path. • "Delete Broken Shortcuts" will send the selected shortcuts to the Recycle Bin.